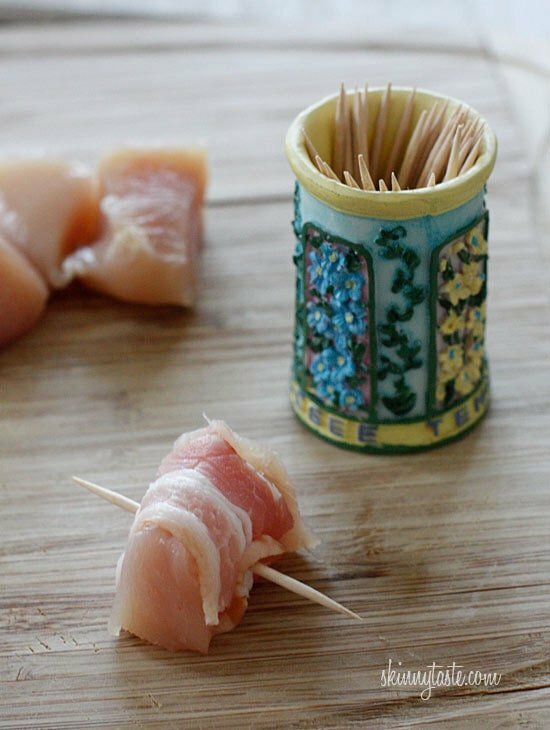 Bacon Wrapped Chicken bites are the easiest two-ingredient appetizer, and they are sooo good! Chicken and bacon is the best combination, some favorites on my blog are this Easy Skillet Bacon, Chicken and Green Bean recipe, and this Rosemary Chicken and Bacon Salad! Whether you need an appetizer for the Holidays or for watching the game, these never disappoint! The salty, smoky combination of the chicken is perfect when paired with a sweet dip like Sweet red chili sauce or duck sauce, but it’s totally optional! 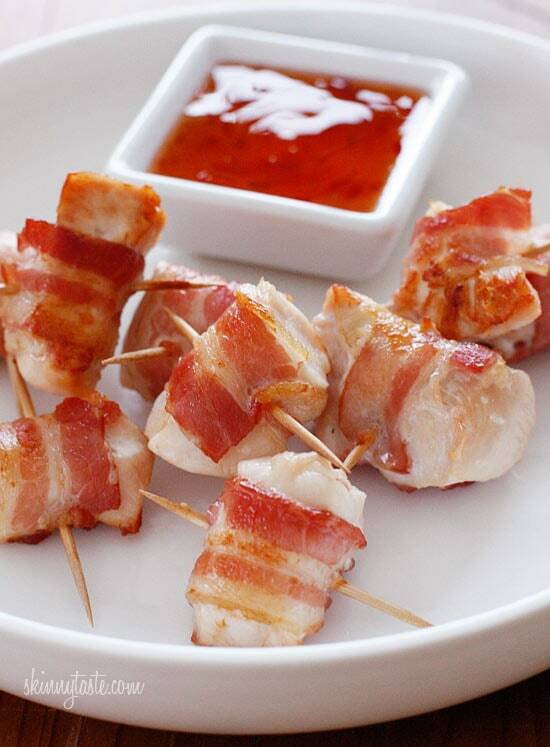 Using center cut bacon reduces the fat, and wrapped around lean chicken breast you have yourself one delicious appetizer. I used to make these with my Mom as a kid. I recall looking through the oven door, waiting impatiently for them to come out! 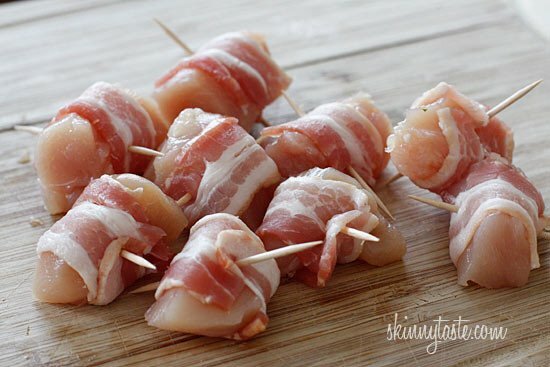 Bacon Wrapped Chicken Bites – This is the easiest hot kid friendly appetizer that you’ll ever make. Uses only TWO ingredients and it’s soooo good, I guarantee these will disappear in minutes! Preheat oven on to 375°F. 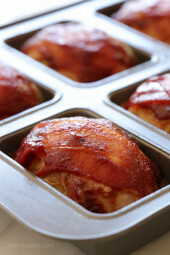 Wrap a piece of bacon around each piece of chicken; secure with a toothpick and place on a baking sheet (use foil for easy cleanup). Bake on the lower rack turning halfway, about 12 minutes on each side, or until thoroughly cooked and browned. Blot on a paper towel and serve right away. This is one of the easiest and favorite dish for my family. We make this as dinner, not appetizers. 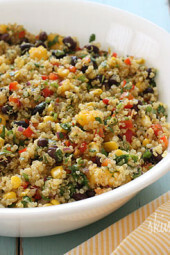 Perfect for pot luck dinner (you’ll have so many new friends) or for a party. Simply, yet so delicious. Fast and easy, perfect recipe. I assume this means: bake for 12min, then turn them over, then bake for another 12min, or until cooked and browned. I mean we’re not supposed to turn them at about the 25min mark, right? Really shouldn’t be added tangents in the middle of a sentence without adding parentheses. Correct, bake for 12 min, then flip and bake for another 12 minutes. I’ve made these several times and they’re great–especially with the Thai chili sauce. The only change I make is I season the chicken with pepper, garlic powder, Italian seasoning & a tiny bit of salt before wrapping in the bacon. Somebody necessarily lend a hand to make significantly posts I might state. That is the first time I frequented your web page and to this point? I amazed with the research you made to create this actual post amazing. Excellent job! These are really good,but took a lot longer to cook at least 45 minutes, if not longer to get crisp. Hi! What sauce is pictured with these? Hi! It looks delicious, but I'm wondering how can I prepare the sauce? Made these this past weekend for a party I was hosting and they were extremely popular. I agree with the broiling comments because even after 30+ minutes at 375 they weren't done. Very easy to assemble before-hand and then pop in the oven when people arrive. Thanks for a great recipe, I also used the spinach artichoke dip and the guacamole deviled eggs and I loved everything! My 6 year old never wants seconds of anything that's meat…until he met these. I think he would have eaten the whole recipe if I had let him! I made these for dinner tonight and they were awesome!!! Nice, quick meal that even my picky 6 yr old loved. I'll definitely make again. These are amazing! My husband requests them for every event now. I agree with broiling for a few minutes at the end. I add a little salt, pepper and garlic powder for a little more flavor. Awesome dipped in BBQ sauce or light honey mustard! I've been using these as a low-carb high-protein snack for my husband. We use turkey bacon to lower the fat and they taste delicious. Also, I went with Helga's suggestion of using some chili powder and a little bit of brown sugar for added flavor. These are fantastic! Thank you Gina! Broil for a few minutes at the end to make the bacon crisp up! This was fantastic… as you said, they went very quickly. I served with Thai red chile pineapple sauce (which apparently has been discontinued? :() and BBQ sauce. Very easy to make and delicious! Thank you. Looks yummie, perfekt for a nice movie evening. What is the dipping sauce showed it looks good. I scanned posts but didnt see it. Thanks! I know Gina from Skinnytaste likes that brand and has recommended a similar sauce for another recipe. I think she used the regular chili version for this recipe, but I liked the pineapple one. I used honey maple bacon and it was very good. I let my bacon cook a little too long the first time but the second time they turned out great. Thanks. I made these yesterday and they were de-lish! Next time, I'm going to try using a chicken tenderloin, put enough of one piece of bacon on to go lengthwise, cook, and eat with sweet chili sauce. I'll still get the taste of the bacon per bite, it will be less calories/fat (since I ate more than 3), and I can be lazy. 😉 We'll see how it goes… Thanks for the delicious recipe! 🙂 P.S. The chili sauce we really liked (we tried two) was the Mae Ploy Sweet Chilli Sauce. I made these for my niece's bday party. I was not sure what to expect but they were certainly a huge hit of the party. I really think that the sweet chili sauce at least for me made them even that much better. My mom and dad were like, oh my, these are good. i made some with the dry hidden valley ranch dressing mix, also. Everyone asked for the recipe so, I posted them on my sister's FB page for them to go directly to this website. They also could not believe that these were a weight watchers recipe. I would also like to know if they would be okay in a crock pot after they have been cooked? I am having a hard time finding a lower fat bacon. I have found a center cut bacon that is lower in sodium but the fat content is not much different from regular bacon. Is there a specific brand you use? I made these for an appetizer dinner for my dd's birthday with her friends (along with your Santa Fe stuffed potatoes). They were GREAT. About 10 minutes before they were done, I spooned about a teaspoon of Trader Joes sweet chili sauce on top of each one. They ended up even BETTER! I just made these for dinner with some roasted green beans and mushrooms on the side. I chose to skip the sauce for the chicken & didn't miss it at all. DELICIOUS! Cooked these for my super bowl party and they were a hit! Very good!! 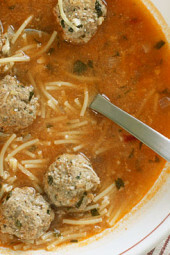 Think these will stay warm in a crockpot after i make them? want to take them to a gathering but probably wont' be eating right away! Made these for a party tonight, they disappeared very quickly! No one could believe they were only two ingredients (we set out sweet chili dipping sauce and peppercorn ranch for them as well-both delicious, if not low-cal!). I use recipes from your site all the time and serve them to non-dieting friends that LOVE the food and have no idea it is "healthy." I do something similar but instead of any sauce, I just dredge them in a mixture of dark brown sugar and chili powder. I wonder how much this would affect the points value – because to be honest, they're not THAT much brown sugar. We just did these for dinner and everyone loved them. We broiled them for a minute or so to make them a little crispy and they were wonderful. It's so much easier doing WW with all of your wonderful recipes. Thanks Gina. I just made this tonight and they are delicious! Any tips on how to get the bacon a little crispier? You ROCK! I just found your site through a friend. I'm a 37 yr old guy who has just started to cook at home. I made these today and LOVED them! Thanks so much for all you do to give us some great recipes! Much appreciated! These were great! Perfect for the game, except that I wanted to eat them all myself. 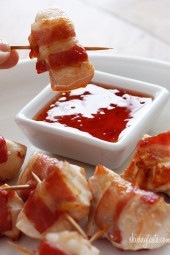 I saw something similar to this on Rachael ray with fresh baby spinach wrapped between the chicken and bacon. It sounds like a delicious treat, you can make a low cal BBQ sauce too to dip this in. Then maybe I won't want a dipping sauce! I think these would be great using shrimp as well!!! Thanks for your cooking ideas! Just tried these tonight, but I mixed them into a ceasar salad! Tasted fantastic. My 2yr old couldn't get enough of them! Definately a keeper! I'm definitely making these on Sunday for a party I'm having! SO easy and they look delicious! I can't wait to try them! This will definitely be added to my appetizer list! Thank you for another great recipe! I just had artichoke heart with the bacon (same deal) and they were AMAZING!!!! Probably even less points because the artichoke heart is 0 points!! You only have to count the bacon….YIPPEE! Yes, you can easily pass these off as not light. Obviously if you eat them all you will be over-doing it! The chili sauce is store bought, Thai Kitchen brand is great in the Asian aisle. Susie, it was actually a souvenir. Makes a cute toothpick holder! Oh my yum! I am definitely adding these to my menu! Hmm, the bites look great, but I have this obsession with toothpick holders, and I HAVE to know where that Tennessee one came from! I love perusing the kitchy tourist sections for one that stands out! Oh, bacon is our favorite thing! I might even be able to get my husband to make these and I might be able to not feel like I totally screwed up by eating them! YUM! Question about the sweet chili sauce- is it homemade or store bought? Is there a recipe for the sweet chili sauce, or if not, can you tell me a good brand. Thanks Gina! The other day I had bacon wrapped water chestnuts! So delicious..crunchy, salty and sweet (because we added a little maple syrop). Also, surprisingly few points! The friend's house that I usually watch the superbowl game at refuses to eat anything healthy related; but her boyfriend is a bit more health conscious. She loves bacon. I think I'll definitely be able to sneak these past the healthy radar & won't telll anyone they're healthy until after they've eaten them. My friends know that whatever I make is usually healthy, so this will be a surprise! 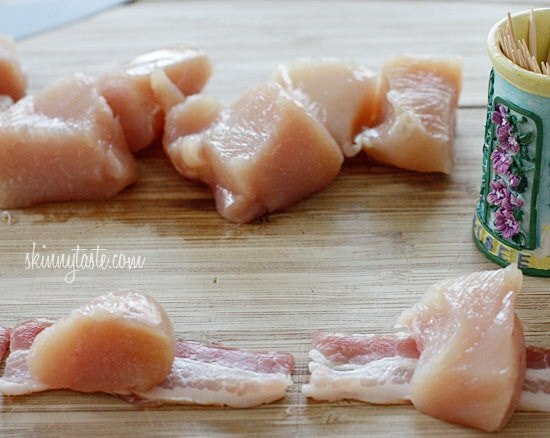 I like to dredge the chicken in dry Hidden Valley Ranch mix first, then wrap in bacon. It doesn't add hardly any calories and the taste of bacon and ranch is delicious! I do something like this but use canned "fresh water chestnuts" in place of the chicken. 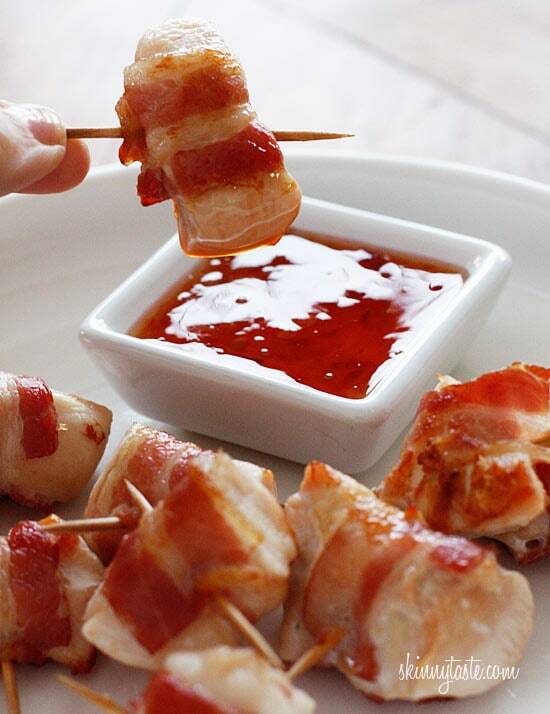 Makes a great passed appetizer at a party….. I like how they have little built in handles, perfect finger food! My husband is getting sick of chicken, but I'm not, this would be perfect for dinner one night, while I only eat 3, he could eat the rest and trust me anything with bacon on it, he'll eat! This looks just wonderful! Making this for dinner one night this week!! These look too good . yummmy everything's better with bacon!!! wonderful…will do this definitely…actually i have the ingredients in my freezer now! I can attest these are awesome. I make them (but with a water chestnut inside) every Christmas Eve. It's the one thing my Mr and mom say I'd better make or they'll poke me with a stick until I submit. I like to add a little Italian seasoning or some kind of salt free spice too. I have seen these done with those miniature sausages but I like the 'healthier' take on that popular appetizer by using the chicken. Spinthemeal, scallops or shrimp are great too! Love the idea of jalapeño slices! The red chili sauce gives it a little kick. Karen, no I've never froze them. I wouldn't bake them frozen, I feel like the chicken would get rubbery. Maybe I'm wrong. I would let them thaw first. Prep time on these are pretty quick. Maybe 5-10 minutes? Yes, total cooking time of 25 minutes. I like the idea of pastrami to keep it kosher. Turkey bacon would also work but personally, there is nothing like the taste of real bacon. Oops, yes, the chicken was a typo, lbs, not oz. Thanks for noticing! Just made these for dinner. They were AMAZING! Next time I'll try putting a jalapeño slice in there too! I saw these on pinterest they look sooo good. I love these! They are a little time consuming to make and they disappear quickly but they are delicious little bites for sure. Interesting idea! My family loves pastrami-wrapped dates (pastrami instead of bacon because we keep kosher) – you get the sweetness of the date and spiciness of the pastrami in one caramelized bite of deliciousness. (For dates, bake only 10-15 min.) I will have to try pastrami-wrapped chicken bites sometime! Love Melissa's suggestion re: jalapeno. Hi – have you tried prepping these and freezing them? If so, how did you defrost them or does it change the cook time at all? thanks! This is a great reminder for me to make these again soon. I like to make this with chicken or beef, sometimes adding a piece of jalapeno between the bacon and meat. Looks wonderful. Everyone loves bacon and like you said…Why not??? Simple and wonderful. So is it a total cook time of 25 min or is that when youz turn them over. Will be doing this and want to try it with turkey bacon! I am making them: turkey breast wrapped in turkey bacon. They are still in the oven but they smell like heaven! I did seasoned the turkey breast with some red dried panca pepper peruvian paste and mashed garlic. 1 tsp of sweet chili sauce is 0 points plus. just double checking the amount of chicken… 1 1/4 oz?? for 10 servings? Thanks!! Looks like I know what I'm bringing to watch the Giants on Sunday! Do you know how many points the sweet chili sauce would be? These look too good to be true to be 2 points on WW! Can't wait to try them for my next gathering.